The result is a performance of festival quality, so entrancing that analysis can only belittle its impact. Chen weaves a tapestry of oriental aesthetics and western song with such understated skill, simplicity and seamlessness that you feel you are part of a mirage. It is enough just to admire the grace and delicacy of Chen’s Javanese dancers and the worldly pleasure given by ENO’s excellent cast. What miraculous insights Chen has conjured from the east, using the unreality of théâtre to make an aesthetic statement on life and death. Chen’s staging introduces oriental elements into what is rooted in western ritual. Stage trappings are minimal and it is the 11 members of the Orange Island Dance Company, the Javanese troupe founded by Chen, who supply that exotic element, creating a tapestry of filigree movement around the dramatic core. It’s a curious fusion, one that creates some beguiling stage pictures. This beguiling, beautiful production — in which East melds with West, dance merges with opera and timeless gestures interplay with subtle modern lighting — would be a wow coming from any company, any year. 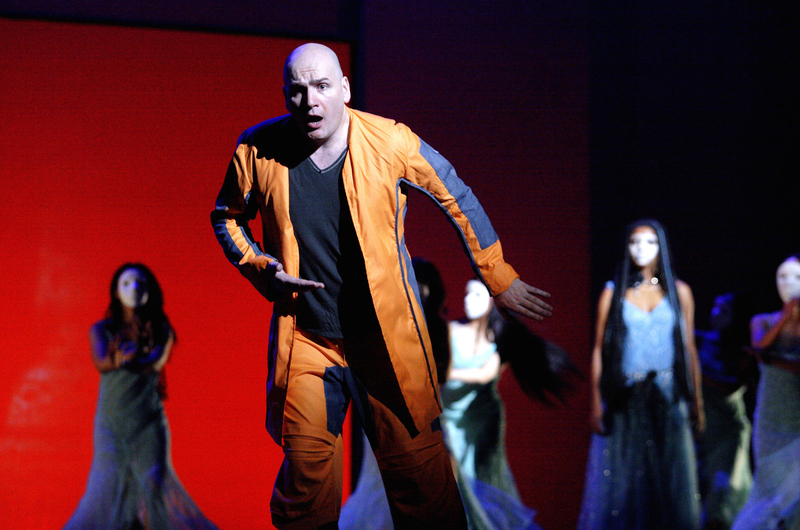 On stage, however, the Chinese director and choreographer Chen Shi-Zheng unfolds the world’s oldest operatic masterpiece with such grace and fluidity that two hours of Greek myth fly by… in one of Chen’s breathtaking strokes of stagecraft… Orfeo’s fatal, forbidden glance at Eurydice … a unanimous shudder of horror. Chen Shi-Zheng’s elegant staging of opera’s oldest masterpiece, Orfeo, puts itself entirely at the service of Monteverdi’s wondrous score. It is a magical mix of East and West which in no way impinges on the earthy drama of the score in all its filigree detail. The interaction of dance and music is, if anything, enhanced by their hieratic gestures, mirrored by the principals in more than usually convincing style. 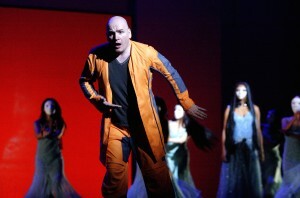 Monteverdi’s Orfeo, is to be welcomed for the beautiful austerity of the visual concept devised by the Chinese director Chen Shi-Zheng, The show has the atmosphere of contemporary dance, rather than opera, and is all the most potent and visually arresting for that…ENO has another artistic hit on its hands. Chen Shi-Zheng has something of a cult following in America, his blissfully simple, visually beautiful and largely gimmick-free Orfeo brings this early masterpiece to vivid theatrical life because his austere, eastern approach throws the spotlight on the singers rather than on attention-seeking set. Chinese-born director, choreographer and actor Chen Shi-Zheng. His production crosses all cultural and expressive borders. Combined with the vivid period sound of the ENO Orchestra in collaboration with the Orchestra of the Age of Enlightenment, the final effect [of Orfeo] is as near-perfect an experience as one could hope for.